Spotify isn't the only streaming audio service embracing brand partnerships. Recently IPO'd Pandora, following up on last Fall's Future Proof channel for Lexus, is now upping the ante with an exclusive partnership with Chase that includes an entire custom Chase Sapphire radio station throughout the Summer. 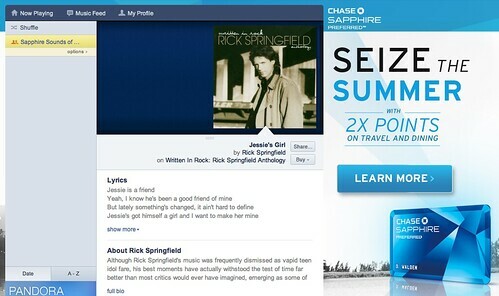 The “Sapphire Summer Sounds” radio station on Pandora, executives say, will "bring the Chase Sapphire brand to life in an easily accessible playlist" featuring artists like Bryan Adams, Sheryl Crow, Rascal Flatts and Katy Perry. Sponsorships and radio are as old as well.. radio (take NPR for example), but the multi-platform assets that streaming radio stations like Spotify and Pandora are specifically built for seem to be paving the way for increasingly more progressive brand partnerships. To support the launch of this partnership, Pandora listeners were recently able to enjoy a full day of limited interruptions courtesy of Chase Sapphire. “Strategic partnerships with companies like Chase Sapphire allow us to deliver the best personalized music experience to our listeners while giving brands the opportunity to connect with their passionate consumers in a fun, creative way through music,” said Heidi Browning, senior vice president of sales marketing, Pandora. The Sapphire Summer Sounds station can be found here.